My heart fills with joy when I see the sea of heads in this meeting. 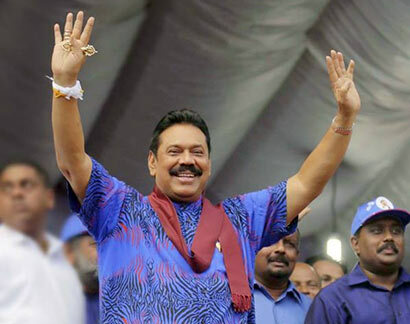 I am proud to be a Sri Lankan and further, I am joyous we have been blessed with a leader of Mahinda’s caliber. For the first time since independence, our dear Motherland has been blessed with a leader whose heart lies with the masses. We have had rightist, centrist and leftist leaders in the past but none delivered. Not because MR is perfect, but for a Sri Lanka we can be proud about and have some self respect when we have to stand with people from other countries, and for a better economic development vote for MR! “a LEADER for the first time since independence….” what a true saying…. i felt it since long time…. The leader destroyed the country!!! Rajapske destroyed then country serious. He destroyed legal system, trapped the country in debt crisis, killed free media and crowned five great forces around him Heroin mafia, casino mafia, ethanol mafia, cigarette mafia and pesticide mafia. People come for meeting for lunch packet and shot of liquor . Transport is provided to them by local politicians. Can you elaborate how he destroyed? Can you site a political party which did not go for credit from international agencies? Have you visit Jaffna / Trinco / Bati / Ampara / Polonnaruwa recently? We are in a capitalist society. We can find only a party which make least damages to the country. Otherwise find a clean left party (not JVP). But before that try to read some political theories, don’t try to learn politics from newspapers. Nimal, the presence of Bas na yaka in this forum serves to display the mentality and political maturity of MR’s opponents. If you bother to look at Bas na yaka’s last ten posts, it is impossible not to think of a brainless parrot repeatedly uttering words borrowed from hear and there. We don’t earn from politics but only looking at this without being biased. Also we don’t bother of the election & accept whatever the result. People like Basnayaka might expect srilanka to become a prostitute land with the support of west, like Kosovo state mentioned in other post here. He is mad sick man who suffers from politics. Is he also fueled by US $ /=….? This kind of political victims killed themselves in Tamilnadu when Jayalalita jailed. Anyway, it seems 1 : 5 the ratio of vote in this political post so far. Rajapske Regime wants to make Sri Lanka prostitute land with casino , not ours. What kind of benefits you and Indra receiving from the family regime. I am not receiving any benefits from the family regime. 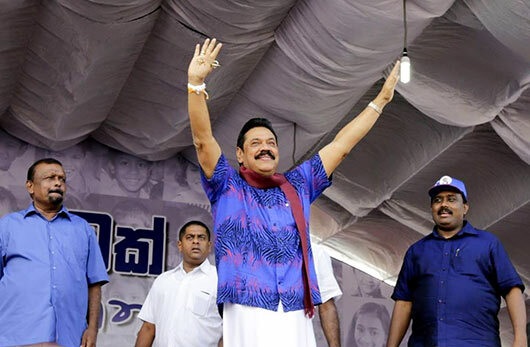 I am seeing the benefit to Sri Lanka if Rajapaksha continue another term as the president (personally, another two terms). SL is a chaos, to make something out of that chaos, what is needed is a firm long term leader with a vision. Singapore (Lee Kuan Yew), Malaysia (Suhartho), Thailand (various military personnel with a common aim) South Korea- all had such a leader before they are there now reaping the benefit of that persons work. Luckily, for them human right and democracy industry (pick as you like, what you like) did not exists then. Read a lot first and talk a little. “One of the asymmetries of history,” wrote Henry Kissinger of Singapore’s patriarch Lee Kuan Yew, “is the lack of correspondence between the abilities of some leaders and the power of their countries.” Kissinger’s one time boss, Richard Nixon, was even more flattering. He speculated that, had Lee lived in another time and another place, he might have “attained the world stature of a Churchill, a Disraeli, or a Gladstone.” This tag line of a big man on a small stage has been attached to Lee since the 1970s. Today, however, his stage does not look quite so small. Singapore’s per capita GNP is now higher than that of its erstwhile colonizer, Great Britain. It has the world’s busiest port, is the third-largest oil refiner and a major center of global manufacturing and service industries. And this move from poverty to plenty has taken place within one generation. In 1965 Singapore ranked economically with Chile, Argentina and Mexico; today its per capita GNP is four or five times theirs. Lee managed this miraculous transformation in Singapore’s economy while maintaining tight political control over the country; Singapore’s government can best be described as a “soft” authoritarian regime, and at times it has not been so soft. He was prime minister of Singapore from its independence in 1959 (it became part of a federation with Malaysia in 1963 but was expelled in 1965) until 1990, when he allowed his deputy to succeed him. He is now “Senior Minister” and still commands enormous influence and power in the country. Since his retirement, Lee has embarked on another career of sorts as a world-class pundit, speaking his mind with impolitic frankness. And what is often on his mind is American-style democracy and its perils. He travels often to East Asian capitals from Beijing to Hanoi to Manila dispensing advice on how to achieve economic growth while retaining political stability and control. It is a formula that the governing elites of these countries are anxious to learn. But opposition MS’s brother is the casino king of srilanka you know? I’m not even registered to vote since many years. At least I’ve received the freedom of living without fear than 1980-2005 periode as a benefit. I don’t care families of them. So far MS also has received US visas + tickets for his family, have you got also? You say “…not ours.” that means you’re a member of this opposition group. I don’t want to know how much $/= bag you get & that’s upto you. Yes, I agree with your suggestion to certain degree but the main issue is for what purposes the loan money are used. Yes, I will have no theoretical knowledge in political science but I don’t like to read the Indra’s comments. I don’t need to read your comments and I feel abhorrence to see even them here. It is a big shame. Some people copy and paste things from different wbsites and argue with us, recommend to read. If they are decent, they can recommend the journal for me. This b.ch could be a designated diplomat. Basnayaka, If you really want to find the original artical, it is as simple as copying and pasting few words of the article into Google search field and hitting the Enter button on the computer. Stop throwing unfounded and irrelevant accusations at other people posting here (eg. me having two names going to change public opinion and voting pattern in the forthcoming general election).